The USDA and Banquet’s parent company agree that America’s #1 Salisbury Steak should be free of bones, big or small. 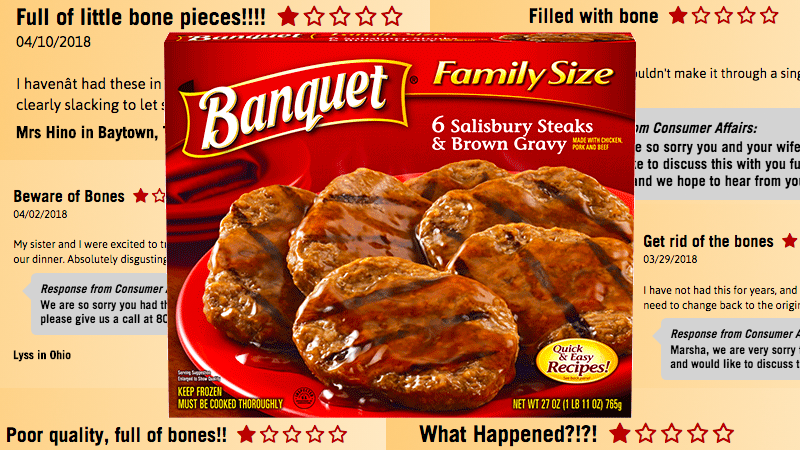 In a statement posted to the USDA’s website on Wednesday, consumers were warned to avoid or throw away cartons marked “Banquet FAMILY SIZE 6 SALISBURY STEAKS & BROWN GRAVY MADE WITH CHICKEN, PORK AND BEEF – GRILL MARKS ADDED.” Specifically, packages with lot code 5006 8069 10 05 and a ‘BEST BY’ date of September 1, 2019, printed on the package. You can see package images here, but you’ll be fully in the clear if you just don’t eat any of the potentially bony steaks.